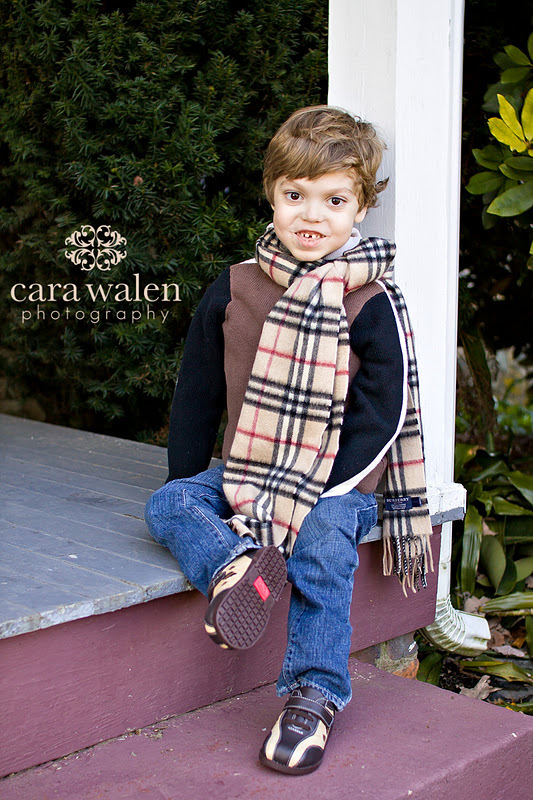 I have a dear cousin who has a son, aged five, who has congential muscular dystrophy. Diagnosed around the age of one with a rare form of genetic lamin-type MD, Gianni has grown into an incredibly, bright, beautiful, happy boy who simply lights up a room whenever he is in it. He loves life, finds the joy in the simplest of things, is leaps and bounds more insightful and articulate than any 5 year old I know, yet only limited by his physical challenges. He is the light of our lives, a rare gift from God that continues to teach us to look beyond the obvious, to love more deeply, to believe in the purpose of everything on this earth and to never give up hope that one day, he will be able to do what most of us take for granted - to walk, to pick up a rock and toss it into a creek, to run, skip and hop. At a fund-raiser this year for the Muscular Dystrophy Association, where Gianni was the guest of honor, I gladly volunteered a silent auction donation of a family photo session. It was to be auctioned off at Bull Roast in late October but I was determined to do my best to squeeze in the lucky winner in time for holiday card season. So low and behold, I was contacted in early November by the lucky winners and we settled on a date the first weekend of December. Because of work committments in mid December along with the holidays, I decided it would also be my last photo session of the year. I arrived at a favorite spot in Harford County and my clients arrived promptly on time and the weather was gorgeous for the first weekend in December. A family of four, Beth, Ken and their daughter and son, were personable, fun, and quite simply, the most adorable family. I was overjoyed to be able to photograph a family who had fun in front of the camera (and while I wasn't shooting too!) but most importantly, was overjoyed that the whole experience was for MD research in Gianni's name. It was the most feel-good session I've ever had. And to my joy, the images turned out fantastic..for it is truly better to give than to receive. Happy holidays to everyone. I wish you and yours a beautiful holiday, and a safe and prosperous New Year. May 2012 be your best year yet!